LONDON (Reuters) – Arsene Wenger enjoyed a rare away victory as Arsenal’s fans and players saluted the end of his distinguished managerial reign with a 1-0 win at Huddersfield Town in the Premier League on Sunday. The decisive goal came when Pierre-Emerick Aubameyang slid in at the back post to convert a low cross from Aaron Ramsey in the 38th minute but the match itself was almost an afterthought on a day when Wenger said goodbye to his club and English football. Huddersfield were fitting hosts for the occasion. Not only did their officials and supporters show warmth and appreciation for Wenger but there was also a historic connection that was not lost on the Frenchman. “Herbert Chapman, maybe our greatest manager, was from here and for me to come here for my last day, had a special meaning,” said Wenger referring to the Yorkshireman who won two titles with Huddersfield in the 1920s before enjoying two more with Arsenal in the following decade. “When you know the history of our club, for me it had a special meaning. There was a photo just in front of the dressing room where Chapman smiled at me,” noted Wenger. Arsenal ended the season in sixth place, their lowest finish during Wenger’s time at the club, but at least they managed their first away win of 2018. “We wanted that away win. We hadn’t managed to do that yet so it was important to end Arsene’s final game with a win,” said Ramsey. “He told us to go out, play how we wanted and win. It is going to be strange without him next season but he has been brilliant and we will forever be thankful,” he added. With Huddersfield celebrating survival at the end of their first Premier League campaign, acknowledgment of Wenger’s final — and 1,235th — game in charge took place before the kickoff. 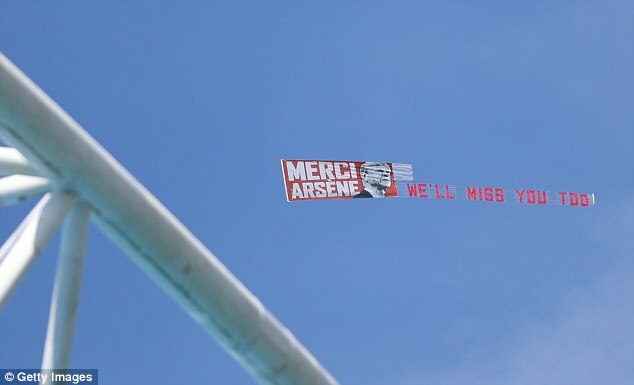 Once the action was under way, a plane flew over the ground carrying the banner “Merci Arsene – we’ll miss you”. In the 22nd minute, the entire ground stood to applaud Wenger, whose achievements — including three Premier League titles, seven FA Cups and a 49 game unbeaten run — were celebrated in song by the travelling North London supporters. “Of course it is very emotional after 1,235 games for the same club. To enjoy it we had to win it, winning football games is what makes me happy and the boys did it. It was a good day for everyone with Huddersfield staying up too,” said Wenger. He added that there was no sense of relief that his farewell period had come to a close. “Not really, I’m sad,” he said. “At some stage it has to end, I wish everyone well, the fans have been great until the end and I wish the club well for the future.